One of the most visually striking elements of The Last Jedi—aside from the epic space battles, of course—is Crait, the glittering mineral world that becomes the focal point of the film’s final act. But as alien as this planet seems, Crait was shot right here on Earth, meaning there’s loads of real-world geology, ecology, and climate science behind this Resistance hideout. Mild spoilers for Star Wars: The Last Jedi to follow. The showdown at Crait, between the First Order and the tattered remnants of the Resistance, appeared to take place in a vast, desertified basin. We quickly learn that this landscape isn’t covered in ordinary sand, but in salt, when a Resistance fighter, surprised to see the minerals turn from white to red as they’re kicked up, decides to taste them. Salt flats are found all over the world, but to capture the endless white vistas seen here, the filmakers had to go to best of the best. Crait was shot at Salar de Uyuni, the largest salt pan (salar) on Earth stretching nearly 4,000 square miles across the Bolivian Altiplano of the High Andes. While the planet’s Earthly counterpart doesn’t have color-changing sand—more on that in a moment—it’s as ethereal and otherworldly as salt flats go. Bright white and as barren as the Moon during the dry season, the high-altitude landscape turns into an endless reflective mirror during the wet season floods. Only a handful of plants and animals live there, including giant cacti and three species of south American flamingo, which breed on the salar every spring. There’s even an Andean fox that ranges across the salt flats, although it’s not quite as Narnia-esque as its scifi counterpart. Like many salt flats, Salar de Uyuni is a testament to the power of climate change. According to the US Geological Survey, the salar is the remains of a series of giant lakes that stretched across the Bolivian Altiplano during the last Ice Age, drying up about 10,000 years ago at the onset of the Holocene. Mike Malaska, a planetary scientist at NASA’s Jet Propulsion laboratory, told Earther it’s reasonable to assume that Crait’s salt flats formed in a similar manner—through gradual tectonic changes and climate change-induced evaporation in a closed basin. “Maybe the landscape was formerly a lifted evaporated sea floor or basin so that there are salts in there,” he said. “Then faults forms, landscape shifts, and mountains get shoved up, and valleys get dropped down,” slowly filling in with sediments over time. 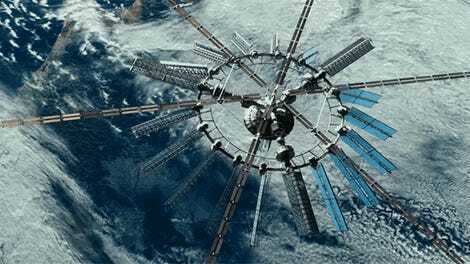 He added that the idea of an entire planet becoming covered in such landscapes “could totally work” with the right ingredients, including a planetary weather cycle, tectonic activity, and some sort of long-term climactic forcing. Crait does have one dramatic flourish that distinguishes it from Salar de Uyuni—that bright red coloration that’s only visible when the glittering surface is disturbed. Malaska could think of a few potential explanations. For one, it’s possible that we’re looking at a very thin coating of salt, atop some sort of bright red soil. “When salts and dirts are mixed and wetted, the salts can dissolve, then get wicked up through the dirt and evaporate, making a nice white crystal evaporite on top,” Malaska explained. The salt’s crimson color could also be the result of radiation damage—halite (table salt) can turn dark red-brown, and sylvite (potassium chloride) can turn purple when radiation bombardment causes defects in the minerals’ crystal structures. In this case, recrystallization of a thin, upper salt layer has reset the crystal lattice, but the radiation damage—and bright colors that accompany it—are visible right beneath the surface. Finally, Crait’s crimson salt streaks could be the result of some weird alien microbes. Plenty of salt-tolerant microbes live in salars on Earth, taking advantage of the ample sunlight and abundant chemical energy available in the minerals. But they have to be UV radiation-tolerant, a feat which certain bugs, like the pink cyanobacteria in Death Valley’s salt flats, accomplish with brightly-colored pigments. 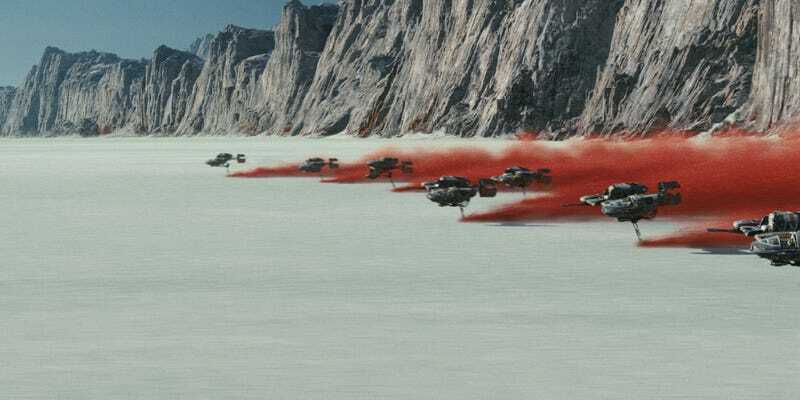 Perhaps Crait’s microbes have evolved a red pigment to protect them from the harsh, alien sun. It’s amazing that we have places like Salar de Uyuni on Earth, better yet when they can inspire fictional worlds that enrich stories we love. But it’s also important to note that these landscapes—as inhospitable for human life as they seem—aren’t immune to the threats of industrial society. In the information age, Salar de Uyuni is a glittering jewel in more ways than one. Just beneath its surface, the salt flat harbors volcanic brines that all told contain an estimated 5.4 million tons of lithium, a metal used in the batteries that power everything from smartphones to electric cars. Recently, the Bolivian government has started making moves to mine it, with President Evo Morales pledging to invest $995 million in the country’s lithium industry by 2019, according to reporting by the Guardian. Environmentalists worry that lithium mining could destroy the salar’s unspoiled landscapes and delicate ecosystems, not to mention the traditional way of life of the indigenous Aymara people, who have harvested table salt from the region for generations. As movies like The Last Jedi demonstrate, the destruction or degradation of Earth’s salt flats would also rob us of a wellspring of creative inspiration. Perhaps it’s only fitting that Crait becomes the site of a final desperate stand against a fascist empire looking to control an entire galaxy’s worth of planetary resources. Or, maybe I’m reading into it too deeply. Anyway, long live the salt flats. Long live the Resistance.